A Yule Log is a part of Yule or Christmas traditions in many European cultures. Like most traditions it has pagan roots. A large wooden log (usually oak or ash) is decorated, sacred and then placed into the open hearth. There are different customs in each region. Some say that the Yule Log is a protective amulet that brings prosperity. For others it is simply a festive christmas decoration with practical uses. In some regions the Yule Log is an actual tree, carefully chosen and burned on Christmas Eve accompanied by prayers. Others hand down the elaborately decorated Log from one generation to the next. The Yule Log is a symbol for the warmth of the hearth fire. Something that was of critical importance, especially in the olden days. 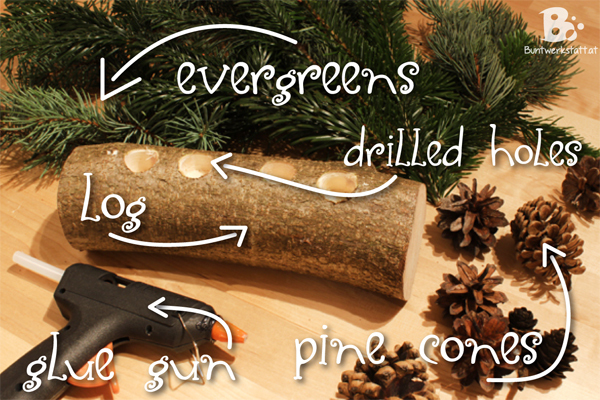 I decided to make a decorative Yule Log, because I’m not sure yet if I really want to burn it on Christmas Eve. 🙂 To add to the symbolism of warmth and fire, I attached some candles onto the log. 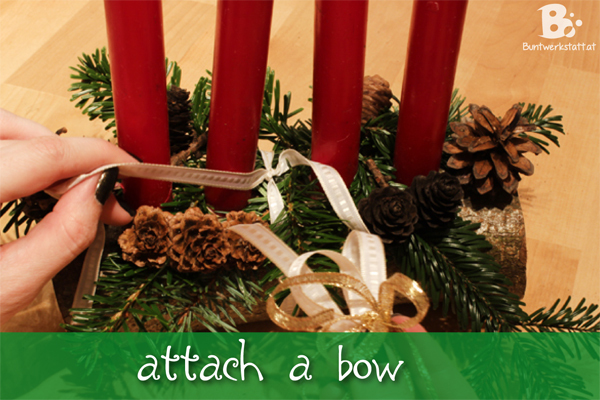 Like that the Yule Log transforms itself into a beautiful table decoration for Christmas. You can use a log of wood or a thick branch, just as you like. You should only insure that the log lays stably on the table. Otherwise it would be very dangerous with the burning candles. 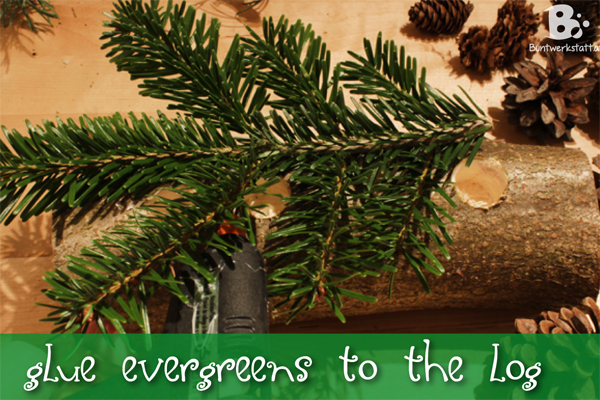 Put a little hot glue on the wood an press the evergreens on top of it. 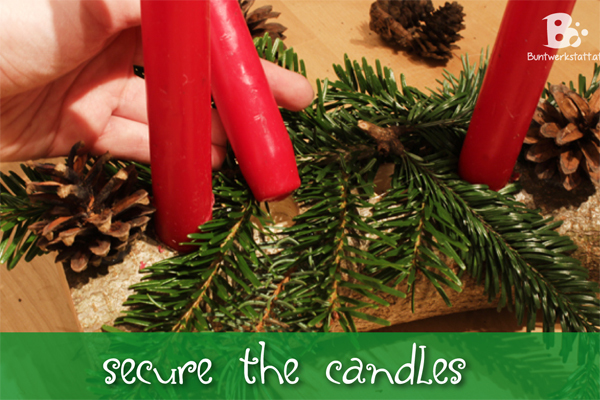 Take care not to cover the holes for the candles. I tried to place each hole between two branches. It is easier if you cut your branches into little pieces and add them one by one. Pine Cones are essential! 🙂 At least I think so. Add some glue to the flat end of the cone and press it down on the wood until the glue hardens. Then it is high time to add the candles! You can additionally secure them with some hot glue if you want. I added some more smaller cones behind and in front of the candles. 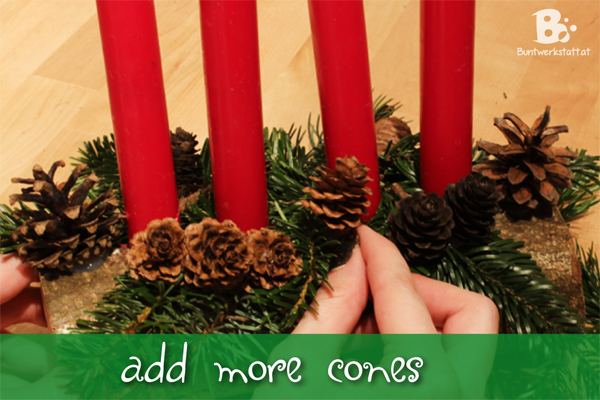 Just glue them right on top of the green branches with a lot of hot glue. It is a perfect craft to do with your kids. 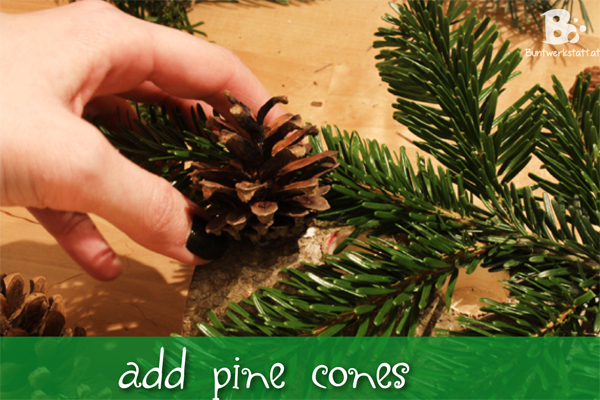 Spend a nice afternoon outside and collect different materials like cones. Then decorate the yule log in the evening and explain the meaning of the log or tell each other christmas stories.